Denver developer Paul Tamburello is the man behind one of Denver’s most recognizable landmarks: The LoHi milk jug … aka Little Man Ice Cream. But to keep the ice cream churning at a growing number of ice cream shops around Colorado, Tamburello is about to open a 6,000 square-foot ice cream factory along West Colfax Avenue. Please join BusinessDen from 5-7 p.m. Wednesday, Oct. 24 for our second Hard Hat Happy Hour, where we will see inside the latest creation from Tamburello and architect Ted Schultz. And hear from them about the vision and challenges of their latest project. Paul Tamburello is about to open a new ice cream factory along West Colfax Avenue. Guests will enter through a front door reminiscent of a walk-in freezer and be presented with a space designed to replicate the internal workings of an industrial ice cream churn. Tickets for the event, presented by Otten Johnson Robinson Neff + Ragonetti, went on sale last week here. Tamburello will use the space at 4411 W. Colfax Ave. to produce more than 2,400 gallons of ice cream per week. The Factory project, which will triple Little Man’s current capacity, is estimated to cost roughly $1.5 million. The company works with 45 restaurants and retail outlets across Colorado. Spectrum is the general contractor on the project. Ted Schultz is the architect. Scout Interiors is doing interior design. Studio 818 is the structural engineer and Kazin is the electrical engineer. US Bank is the lender. 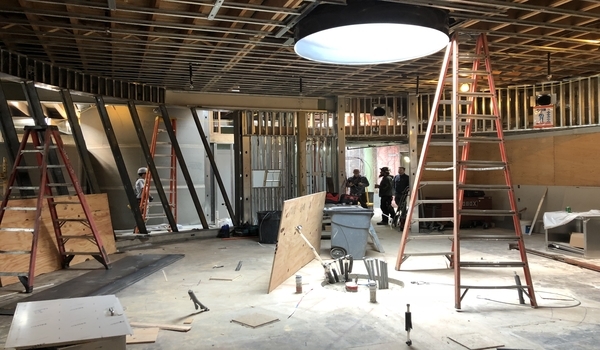 As with all Hard Hat Happy Hours, guests will get a glimpse of the guts of the building as it’s taking shape, face time with those behind the project, and plenty of food, beverages and valuable networking. Plus free Little Man ice cream! 1 Comment on "BusinessDen Presents: Hard Hat Happy Hour at the almost-open Little Man Ice Cream Factory October 24"
The thing I don’t understand is that they are going to have a retail shop out front, but it doesn’t appear that they have any customer parking whatsoever.